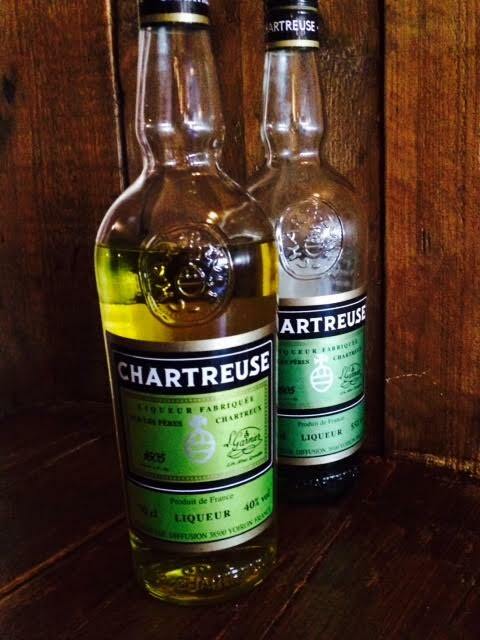 Hopefully you all read our blog on drinks that do good and we are going to tell you more about the one at the top of the list, the french liqueur Chartreuse. Just before Christmas, Del, Paul and myself ventured into Manchester to learn more about the weird and wonderful world of Chartreuse, at relatively new bar ‘Epernay’, situated on Watson Street close to the Great Northern complex. You may have noticed that this unusual French spirit features in a number of our own creations, as well as in classic cocktails such as ‘the Last Word’, one of Del’s favourites, which sees it mixed with lime, gin and Maraschino liqueur in equal measures. However, like myself, you may not know much about its history and origins. We have attended a few tasting events at this venue, including a very interesting one on Brooklyn Gin a couple of months ago, and this one on Chartreuse was equally enjoyable. We were greeted with a ‘Last Word’, and we were given a sample of both yellow and green chartreuse to savour. I will explain the differences between the two a little later on, however before I discuss its uses in today’s ever evolving world of mixology, I will first discuss its long and fascinating history. It was first made by Carthusian monks in 1737 at their ‘Grande Chartreuse’ monastery near Grenoble in southeast France, following a recipe for an “elixir of long life” handed to the order in 1605. The name ‘Chartreuse’ derives from both the name of the order of monks and the location of their monastery in the Chartreuse mountains. It is made from distilled alcohol aged with 130 different herbs, plants and flowers from around the world. ‘The Practical Hotel Steward’ (1900) states that green chartreuse contains “cinnamon, mace, lemon balm, dried hyssop flower tops, peppermint, thyme, rosemary, arnica flowers, genepi, and angelica roots”, and that yellow chartreuse is, “Similar to above, adding cardamom seeds and socctrine aloes”.However, the majority of the ingredients are kept secret and there are only ever two monks at any one time who know the recipe. Many of the ingredients were once found in the surrounding areas of the monastery, however now the majority of them have to be imported in order to adhere to the traditional recipe. The monks make a number of different types of chartreuse, including the ‘Elixir Vegetal’, which was produced first, though at 69% it was understandably made to be consumed in small amounts. The green and yellow varieties were therefore produced to enable people to drink them in larger quantities, and today they are the most popular by far. The monks intended their liqueur to be used as medicine, and people continue to use it to this day to treat a wide variety of medical conditions. There is a vast difference between the green and yellow versions of the spirit, which I will now explain. Green chartreuse is strong stuff at 55%, so not for the faint hearted! It is very herbal, similar to other liqueurs such as Galliano, and the colour is entirely natural and comes from the maceration of the plants and herbs in alcohol for eight hours. It also bears many similarities to absinthe, being a similar colour and sharing an intense floral aroma and anise flavour. The yellow, however, is a lot milder at 40%, and has a much sweeter flavour and aroma. Interestingly, its colour comes from the saffron which is infused in the alcohol. Yellow chartreuse is commonly used with citrus-based ingredients, and this variety is a lot more popular on the Spanish and Mexican markets as they feature lots of citrus flavours in their drinks and cuisine. Some drinks only incorporate a few drops of Chartreuse due to its strong flavour. It is a spirit which can be served in many different ways: many who drink it straight choose to have it served extra cold, however in some places such as French ski resorts, it is added to hot chocolate, and this is called the ‘Green Chaud’. However, its flavour profile can change dramatically depending on the temperature at which it is served. It is a wonderfully versatile spirit, as proven by our cocktail menu which sees it paired beautifully with bourbon and maple syrup in our ‘Golden Oldie’, with mezcal, lemon, basil and ginger in our ‘Mezcalculated’, and with red vermouth, Applejack and vodka in our ‘Norwegian Wood’. What’s also great about it is that it is one of few spirits to continue to age and improve in the bottle! It has also featured numerous times in popular culture. For example, in ‘Death Proof’, a film by my favourite director, Quentin Tarantino, the bar owner serves a green liqueur. After being asked what was just served, he says, “Chartreuse, the only liqueur so good they named a colour after it.” There is also a ZZ Top song, named ‘Chartreuse’, which is about how good one feels when drinking the spirit. Chartreuse liqueurs generally have performed well at international spirit ratings competitions. The green variety has won silver and double gold medals from the San Francisco World Spirits Competition, and has also earned an above-average score of 93 from the Beverage Testing Institute and 96-100 by ‘Wine Enthusiast’. So after learning all about the fascinating history of chartreuse, how it’s made, and how it can be used in so many different ways, I can safely say that I am now a huge fan! The yellow is so enjoyable to just sip and savour the sweet and floral taste, and the green has such an amazingly intense flavour and adds a wonderful herbal element to so many cocktails. So why not come down to Riddles and try some for yourself? I can mix you up an awesome Last Word, better than the boys 😉 Thanks for reading and hope I’ve tempted you to try something new and like Emma said in her recent Riddles blog, its basically good for you!